Gelynis Farm House dates back to 16th Centaury. It is a listed grade 2 * building and there is limited ability to improve access, due to building restrictions. The building has been restored during the last few years and all access points and places examined in order to ensure the safety of our guests. The breakfast room is only accessible via 3 steps, guests who cannot negotiate these have the availability of a continental breakfast in their room. 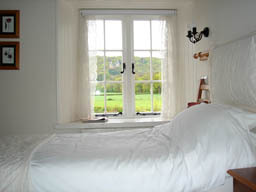 We aim to make your stay with us as comfortable and enjoyable as possible. Please feel free to call us with any queries. The guest House is approached by car from the main road through Morganstown - B4262. The lane descends to a tarmac road across a field to a level crossing controlled by lights and manually opened gates. The Guest House is on the Taff trail long distance cycle path. We welcome walkers and cyclists. Radyr train station is approximately 1/2 mile away and can be approached via the Taff Trail which is tarmac all the way. There are buses to Morganstown and the neighbouring village of Tongwynlais with a short walk along the Iron bridge road. There are good local taxi services. The ample car park is adjacent to the rooms and they are all accessed across a gravel courtyard. Full assistance is provided to Guests needing help with their luggage and access. All doors are a minimum of 750 cm wide. Emergency lighting is installed throughout the Guest house with directional signs. All rooms have heat detector alarm sound. All ensuite showers are thermostatically controlled. Angle poised lights are available in every room. Torches are provided. Outside courtyard lit by sodium lights. Stable bedrooms have motion sensor lighting to access them. Drying room and cycle store available. The front door has a low level handle. The reception desk is at a low level. There is a unisex toilet in the reception area but this has restricted access for wheelchairs. Seating is available in the reception area. Twin or super king bed, on first floor level. Bathroom has a low access bath. Carpeted stairs and bedroom. Morgan room - Access at ground floor level. 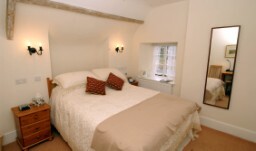 Double bed room with ensuite shower room. Lambert room - Room accessed by way of shallow flight of stone stairs to balcony. 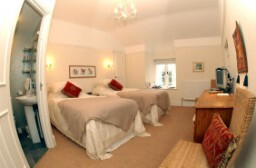 Twin room with ensuite shower room. Carpeted room. 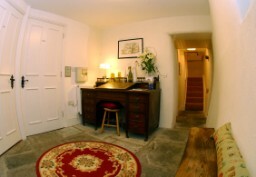 Bute room - Room accessed by way of shallow flight of stone stairs to balcony. Twin room with ensuite shower room. Carpeted room. 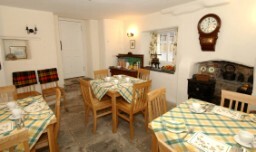 We have a large flat garden access by two large garden gates. 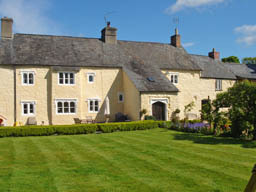 Guests are very welcome to enjoy the garden which is south facing and has garden seats around the area.